A super light front drag reel designed for ice fis..
Small, universal reel with front drag system. 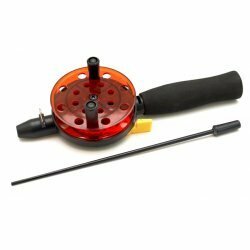 Desi..
Light, finesse reel designed for ice fishing. Made..
Modern reel designed for ice fishing. Small and li..
Gear ratio: 5.1:1 Qty of Ball bearings (pcs): 3+1..
Ritv on ehitatud Mikado Crystal Ice 701 MH ridvast..
Rapala 70 2-C Rod Sufix Ice Fishing Line 0.20 mm ..
Classic Ice Rod 70 2-C Sufix Ice Fishing Line 0.2..
Rapala 90 2-C ROD Sufix Ice Fishing Line 0.20 mm..
Rapala 90 PH/DT Rod Sufix Ice Fishing Line 0.20 m.. Traditional Scandinavian design ice rod with cork ..
Ultralight ice rod made of graphite. Excellent in ..
Advanced ice rod with extra steel side bar for fix..
Advanced ice rods with very sensitive tip. For flo..
Allround ice rods, designed for float fishing, or ..
Strong and stiff ice rod. Finished with guides, re..
Light and stiff ice rod, 50 cm long. Finished with.. Very powerful ice fishing rods made from solid car.. The work on this rod for ice spinner fishing began.. Excellent ice rod, light and stiff. Made of carbon.. The same rod as Merry-go-round, but made of compos.. Excellent, telescopic rod designed for ice fishing..
Soft, under ice rod, 50 cm length. Finished with g.. These combos have the sensitivity and strenght to ..